With the availability of lime putty, hydrated lime, formulated lime, hydraulic lime and natural hydraulic lime in various grades, there are lots of potential choices to make. It’s no surprise that these many types of construction limes can cause confusion for specifiers, contractors and home owners! This website aims to demystify the topic and give people the necessary guidance to make the right choices when it comes to lime binders, selection of the correct sands and provide information on correct mixes……..it’s not all about natural hydraulic lime! 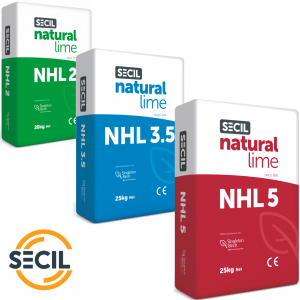 Natural hydraulic lime or NHL, comes from limestone that has natural impurities of clay and other minerals. There are three European classifications NHL 2, NHL 3.5 and NHL 5 based on the compressive strength of laboratory mortars after 28 days. These are often somewhat misleadingly termed feebly hydraulic, moderately hydraulic and eminently hydraulic. The strength of a hydraulic lime mortar (HLM) varies depending on the manufacturer of the hydraulic lime. Some natural hydraulic lime will test higher in the qualifying band, and some test lower. HLM will also vary depending on the ratio of lime binder to aggregate and the type of aggregate or sand used. Unlike lime putty which is ‘non-hydraulic’, natural hydraulic lime can set in damp conditions (indeed it requires water for a minimum period of around 72 hours to gain strength). We generally recommend the use of natural hydraulic lime where the need for breathability and lower strength is outweighed by the desire for an earlier and harder set, such as working on bedding hard masonry, wall copings, chimneys and slate floors. In some circumstances hydraulic lime mortars may be used for rendering or plastering. Our All About NHL page provides a wealth of information. For more information and other products for traditional buildings please go to our main website. Please e-mail us or call our technical sales team if you require further information or would like to purchase materials.